Patty was a real star. I will never forget her, her all-embracing passion for life, her love and concern for all whom she knew, and the beauty of her person, both inside and out. Associate Professor Emerita Patty Rigby, a national leader and a beloved member of our Department, passed away on October 7, 2018 in her 64th year. Prof. Rigby was a paediatric occupational therapist and long-time clinician and researcher at Holland Bloorview Kids Rehabilitation Hospital. While completing her Master of Health Sciences at McMaster University, Patty co-founded the Person-Environment-Occupation Model with Drs. Mary Law, Barbara Cooper, Lori Letts, Susan Strong, and Professor Debra Stewart: the PEO Model is now foundational within rehabilitation research and education. After receiving her PhD from Utrecht University in 2009 she became a Senior Scientist at Bloorview Research Institute and collaborated with many of their scientists, including Drs. Tom Chau, Steve Ryan, Virginia Wright, and Gillian King. Patty is/was so central to our departmental life that losing Patty is like losing a member of the family and I am sure we are all feeling this loss very deeply. The loss of Patty is tremendous, but so is her legacy – she has touched us all in countless ways. Having known Patty for all of these years and being able to see her smiling face as she came off the elevator and walked down the hall saying good morning to everyone she sees— always stopping at my office to see how I am doing. It is something that I will terribly miss but will always keep with me. Prof. Rigby has been an integral member of the Department since 1994, when she first joined the Department as a lecturer. She was the Graduate Coordinator of the MScOT program when it was initiated in 2001. She set the standard for excellence in supporting our students, and also developed the Student Affairs Committee, which continues to play a prominent role in administering recruitment and admissions, student awards, and student resources and supports throughout the academic program. In 2011, Prof. Rigby assumed the role of the Department’s liaison with the Physical Therapy and Occupational Therapy Alumni Association, and established several initiatives to engage MScOT alumni. She approached these tasks with the same passion and dedication she gave to teaching and research, creating initiatives such as developing a strong alumni presence on our website, coordinating alumni events, and most recently, initiating a Facebook presence to honour the Department’s past, present and future as we celebrate our Centenary anniversary. Patty loved her work in the Department and demonstrated excellence and enthusiasm in all that she did, whether it be teaching, service, or research. Beyond that, she was such an asset to the department in her genuine care for her colleagues and for the students. I have a wonderful picture in my head of Patty as the beadle carrying the ceremonial mace at Convocation a couple of years back. She did it with pride and dignity. I felt proud that she was a member of our department and my friend. 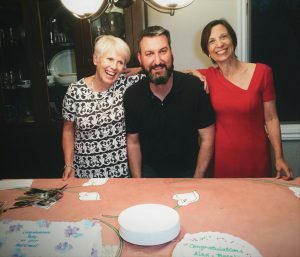 I have always felt supported by Patty through many transitions in my life. She was kind, supportive, dedicated, sincere, and had a lovely sense of humour. My favourite year was when we designed the neuro course together. I learned so much from her and she helped me to see the benefit of different ways to teach in order to engage students. Patty never needed the limelight – she was always happy to do her meaningful work with excellence. One of my favorite memories of Patty was one of my earliest. Patty was my research supervisor when I was an undergrad student. I was not the strongest of students at that time, and Patty was always so encouraging and supportive. I will always remember Patty looking at me and saying “you can do this.” That was just who Patty was to all of us. Always willing to listen, provide support, a hug or a laugh. I will miss her dearly. There are so many things to be said about Patty, and also so many things that words just cannot say. For more than two decades I have enjoyed her kindness, her interest in the people and the world around her, her intellect, her humour and her beautiful, uplifting smile. Without fail, she was calming but motivating, humble about her accomplishments, and so very optimistic and encouraging to others. Patty and I often teased each other about getting older (of course we are exactly the same age) and inevitably ended our ribbing with a hug. I’ll really miss that hug. Patty accomplished so much in the department and is admired for her intelligence and kindness. She also had a playful side about her. We shared so many laughs and enjoyed countless fun activities together. Her positive outlook on life made everything brighter. All of these moments and memories that we shared together were so special because she was part of them. 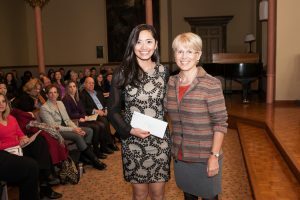 Numerous awards were bestowed upon Patty recognizing her outstanding service, research and teaching. 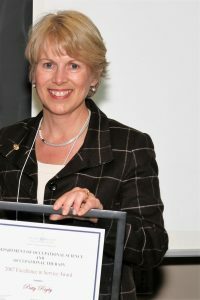 Upon her retirement in 2017, she was awarded Associate Professor Emerita status by the Faculty of Medicine in recognition of her long service and exemplary leadership. This past June, Patty received the 2018 CAOT Life Membership Award for her outstanding contributions to the profession. Prof. Rigby’s contributions to the Department, to her research, and to the profession reflect her deep commitment to occupational therapy. 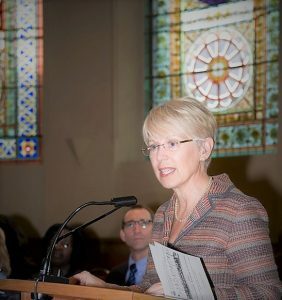 But more than this, Patty’s commitment was to the many people whose lives she has touched – decades of students, mentees and her colleagues in the Department and across Canada; her circles of friends and family; and the children to whom she devoted her lifetime’s work. Patty was an amazing scientist, scholar and educator who has contributed much to her field. Yet, what holds the greatest value for me is the fact that she was such a lovely individual who has made a significant impact on the people around her. I have lovely memories of Patty stopping by my office to see how I was doing, offering words of encouragement and support. In an academic environment that can appear to focus on and emphasize what is produced, Patty excelled in supporting the individual and valuing relationships. Patty contributed so much to the world around her and the people in it. She had so many special qualities that endeared her to us, her colleagues. One part of Patty that was very special to me was the way she looked. There was nothing superficial about her appearance. Aside from her beautiful smile, always welcoming and supportive, there was something almost ethereal about the way she looked. The artist in Patty having put the colours and fabrics and shapes carefully together, connecting with others at an almost spiritual level. She made everyone feel special and loved and that is a true gift. Patty was a warm presence in the department always and her light will be truly missed. The way I remember her is very much as everyone has said – caring, supportive, gracious, kind and always taking time to say hello – never as she was rushing but always pausing and truly interested in how I was. 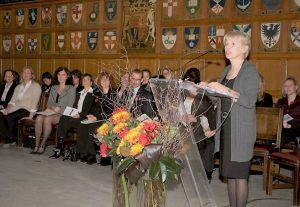 Patty’s spouse Dr. John Wedge and her family ask that in lieu of flowers, donations may be made to the Patty Rigby and John Wedge Graduate Scholarship in Science and Technology, which supports doctoral stream studies in occupational science in the Rehabilitation Sciences Institute at the University of Toronto. Donations to the Scholarship can be made online; or, please contact Katie Rock, Senior Advancement Officer, at katie.rock@utoronto.ca or 416-559-2731 for other donation options. Donations to the Palliative Care Unit of the Michael Garron Hospital in Toronto are also welcome.